Platforms come and go. User behavior changes. As a result, the way brands approach social media has to change too. Heck, looking at a guide on how to “dominate” Facebook from 2010 feels like reading hieroglyphics today. Rewind back to as recently as 2017. Consider how much the social landscape has already evolved. And honestly, that doesn’t even scratch the surface. So, what social media tactics should be cornerstones of your strategy in 2018 to remain relevant? 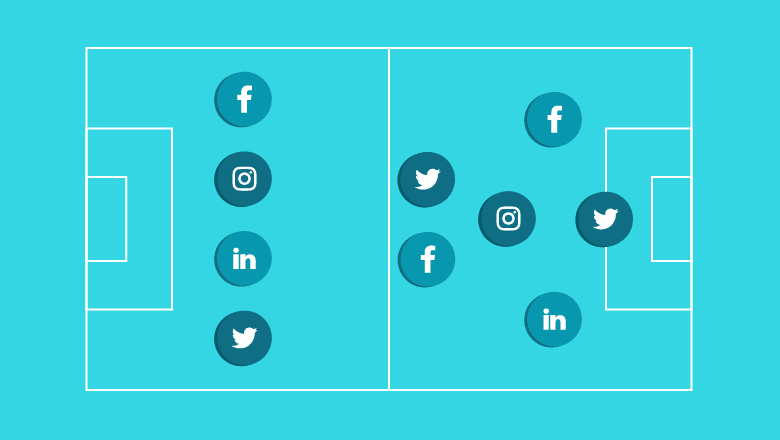 We’ve broken down nine evergreen social media tactics that go hand in hand with the best practices of today’s social platforms. If you’re looking to crush it in 2018 and beyond, any combination of these strategies is totally fair game. Blasting promo link after promo link is a far cry from an effective social strategy anymore. This rings true for pretty much any social platform, especially if you’re looking to score more followers. In short, people are sick of spam and impersonal brands alike. This is why storytelling content is all-the-rage right now. Oftentimes lacking any sort of concrete CTA or accompanying link, story-based posts are meant to drive discussion rather than clicks. This LinkedIn post from Backlinko’s Brian Dean is a shining example of social storytelling in action. 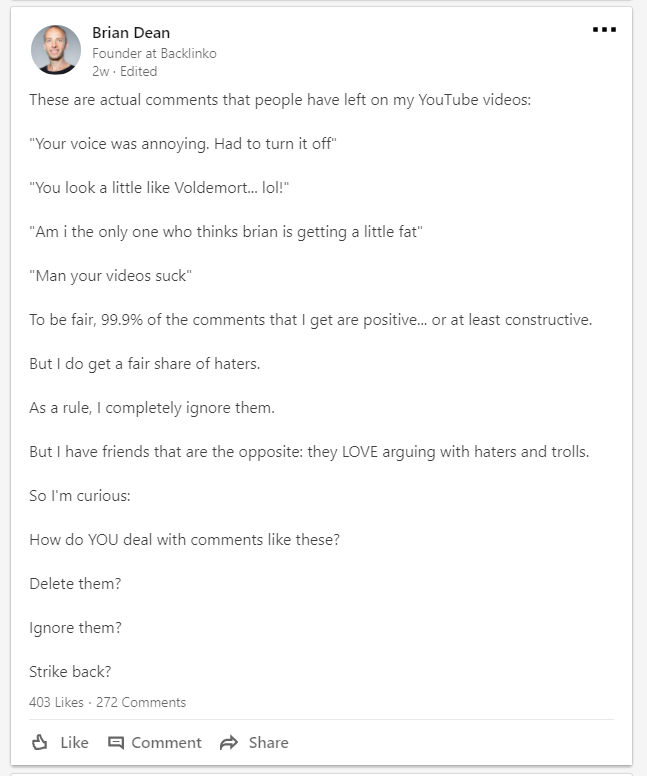 Debate-driven posts like this not only get a lot of love in the comment section, but also give you a chance to show your brand’s vulnerable side. Meanwhile, popular Instagram accounts such as Humans of New Yorkthrive almost exclusively through emotional, storytelling content. 1) Followers view them as positive, meaningful messages rather than marketing spam. 2) In the wake of algorithms demoting promotional, link-heavy brands, these posts have a better chance popping up in your followers’ feeds. The takeaway? Not everything you post needs to be a promo, nor should it be. Speaking of algorithm changes and promos, we need to talk about Facebook. Facebook’s recent announcement to deemphasize brand content has sent some marketers into full-blown panic mode. While the specifics of the update aren’t crystal clear and it’ll take some time to see the changes take effect, Facebook themselves have provided advice for brands hoping to weather the new algorithm storm. Facebook is explicitly putting their foot down on social media tactics they see as “engagement bait.” This includes excessive “tag-a-friend” or “like this post if you ____” content, which Facebook sees as little more than a cheap attempt to game their algorithm. To piggyback on our first tactic, brands should strive to post fewer links pointing back to their sites if they want to realistically show up their followers’ feeds. Facebook is actively encouraging brands to post video content, for example. Meanwhile, the popularity of text-based question posts, storytelling posts and memes serve as an alternative to link-based posts. Given that content labeled as promotional is being actively demoted or hidden, brands have even more of a reason to start experimenting with Facebook’s ad platform. Rather than be totally frozen out from the feeds of would-be customers, creative ad types such as carousel ads may very well be your best bet for getting discovered. Based on our findings on the best times to post on social media, it’s clear that brands today need a ton of content to fill up their social calendars. We’re talking multiple posts per day across multiple platforms. Turn quotes and stats from blog posts into share-worthy graphics (there are dozens of free image creation tools to help you do just that, too). Use data from a case study to drive a debate or discussion on Facebook or Twitter. Take tips from a listicle (“12 Ways to X…”) and outline them as a series of scheduled tweets. With these tips in mind, a single blog post could account for dozens of posts across Facebook, Twitter or Pinterest. Rather than treat your content as a one-and-done affair, rethink the ongoing sharing potential of your blog posts. Tagging others has become integral to just about every social network and is a guaranteed tactic for scoring more exposure for your posts. Much like how posts with hashtags receive more engagement, tagged posts tend to earn more attention too. Whether it’s a big player in your industry or someone’s audience you’re looking to tap into, tactical tagging takes almost no time on your part. And if you’re looking for a who’s who in your industry to tag, start by digging through relevant keywords or hashtags. You can also use an influencer marketing tool such as Buzzsumo to clue you in on potential influencer targets. As a side note, don’t let someone’s follower count define their worth as an influencer. In fact, oftentimes targeting niche audiences can actually work in your favor. According to data by Izea, people trust smaller influencers more than they do accounts with 100,000+ followers. AdWeek similarly notes that influencers with fewer followers (10,000 or less) actually have a higher rate of engagement–the ratio of likes/comments versus followers. In other words, just because someone doesn’t have a massive following doesn’t mean they’re not worth your attention. The boom of influencer marketing is actually putting more power into the hands of those with smaller audiences. Among the most important social media tactics for brick-and-mortar businesses, geotagging on Instagram is a fun way to build your local following. Tagging your business’ location on Instagram not only signals yourself as part of the local community, but incentivizes customers to show you some love. If nothing else, the ability to curate customer photos through geotagging is an awesome form of social proof. People know at a glance that you’re a real deal and get a better sense of your brand’s personality. Although the popularity of video content is no secret, brands are looking to push the boundaries of live video in 2018. Facebook has explicitly advised brands to take advantage of Facebook Live in the wake of their algorithm change. They note that real-time videos get six times as many interactions as regular videos. Meanwhile, live videos via Instagram stories continue to spike as well with over 300 million Stories users as of October 2017. Live videos are compelling because they’re presented as must-see unlike a YouTube video or clip you can simply brush off for later. Meanwhile, the raw feel of a live video is refreshing for viewers bored of polished video content. From conducting Q&A’s to providing an up-close-and-personal experience for your audience, expect to see more and more live video pop up in your feeds over the course of the year. With so much competing content and the need for brands to stand out, sometimes your not-so-secret weapon is the people who are part of your network. Brand advocates such as employees and customers should play a pivotal role in your social media strategy. For starters, having your teammates promote your social ensures its reach goes beyond your brand account. Sprout’s team regularly promotes fresh content to their respective followers, for example. Here's our list of the six social media trends in 2018 that your brand must pay attention to this year. See what trends are impacting your industry on social. Sprout Social sat down with Digital Natives Group's Jonathan Jacobs, co-founder and partner of the firm, to talk about successful client collaboration strategies. And as an added bonus, the principles of employee advocacy serves as yet another example of social proof. The more people you have promoting you, the better. Lastly, don’t neglect the importance of showing off the personality behind your brand. The days of “safe,” suit-and-tie branding on social media are over. Brands that shine today aren’t afraid to take the occasional risk to remind followers that there’s a person behind their account. Case in point, the popularity of memes and humorous content. Brands such as MoonPie have carved out a niche on Twitter because they refuse to take themselves too seriously. We could easily imagine an alternate universe where such an account would be treading water. However, MoonPie’s posts receive insane amounts of engagement because of their unique voice. Finding that voice isn’t all about being funny, either. Based on Sprout’s own data, two-thirds of consumers want brands to see brands take a stand on social and political issues. When brands get real, so to speak, followers have more incentive to show loyalty in response. This doesn’t mean that brands should strive to be inflammatory or controversial, but rather not afraid to speak out on issues relevant to their audiences. Doing so is quickly becoming an expectation rather than an exception to the rule. Which Social Media Tactics Will Define 2018 for You? Brands are constantly scrambling for the latest and greatest when it comes to engaging their social followers. By sticking to these social media tactics that mesh with the best practices of today’s platforms, you can do exactly that. Any trends for 2018 you think that we missed? Tweet us and let us know!